Chef Gabriel of Sequim's Alder Wood Bistro has always had a flair for wood-fired Northwest Cuisine. All you have to do is step into his restaurant and smell the YUM! In his spare time, (insert sarcasm here), Gabriel is building a mobile pizza oven! 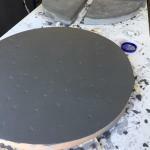 The pizza "stones" are so big they needed to be cast into 4 quarter-slabs, and kiln dried at 1000+ degrees Fahrenheit for 2 hours in order to strengthen the refractory concrete. 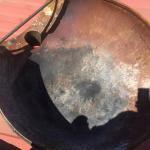 The pizza oven's dome roof is upcycled from an old propane tank! But the creatively doesn't stop there. With big collaborative thanks to John Pabst of Pacific Pantry for smoking and stuffing the house pepperoni made with Short's grass-fed beef, Nash's pork, star anise, fennel & anise seed and three kinds of chili pepper. Gabriel and Jessica Schuenemann love creating delicious food for Alder Wood Bistro guests that is grown, raised and prepared with love from members of their community. Thanks to everyone who helps make the Olympic Culinary Loop and the whole Olympic Peninsula such a delicious place! 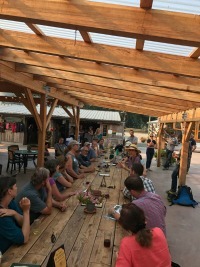 "Lunch & Learn" invites you to join us at the Finnriver Orchard's "feeding trough" as we learn from fellow farmers and restaurateurs who have successfully charted the often turbulent seas of mutually sustainable Farm-to-Chef business relations. Coming off a successful initiative launch in Port Townsend, we invite you to join: Chef's Alison and Dan alongside Farmers Amanda and Crystie, and others, as we share tips and tools for how you can reach new culinary heights in this oft-challenging undertaking. OCL Members save on all Professional Development offerings, and new members - joining the LOOP by March 23th will enjoy "Lunch & Learn" on us! Make it "Bleisure!" Our partners at Chevy Chase Beach Cabins are offering 20% off their rentals "Lunch & Learn" and waiving their 2-night minimum! Contact them or call 360-385-1270 today. Thanks to the "Working Girls" at Olympic Cellars Winery for this "sip"sational primer on pairing holiday foods and the perfect wine! Just in time for our annual listing of just a few of the many delicious Thanksgiving feasts being prepared all around the LOOP. YUM! 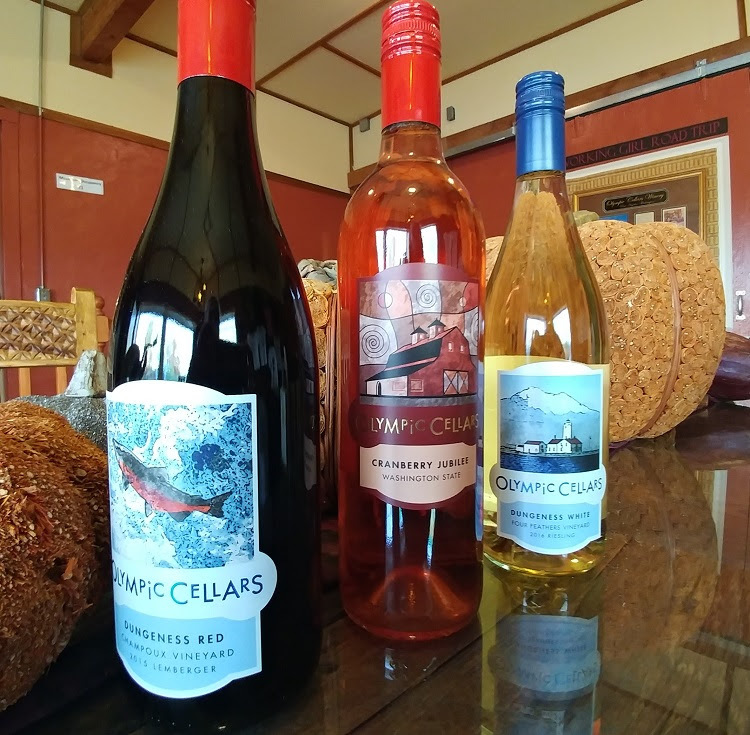 If you can’t visit Olympic Cellars, and all the other OCL member wine and cideries this weekend for the annual Harvest Wine Tour, Olympic Cellars has put together a few suggestions and a three pack wine special to help you on your way. This party pack of Dungeness White Riesling, Cranberry Jubilee and Dungeness Red is specially priced at $50.00. Click here to order on-line. On to the Pairing Principals! Depending on where you are in your wine journey, the idea of pairing wine to food can be overwhelming. This is especially true during the holidays when preparing a meal for several guests. Match Acidity with Acidity Acidic white wines, like our Madeleine Angevine have a crisp, citrusy tang. 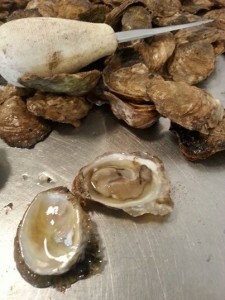 They pair well with any simply prepared shellfish, particularly oysters, but also seafood salad and vinaigrette. 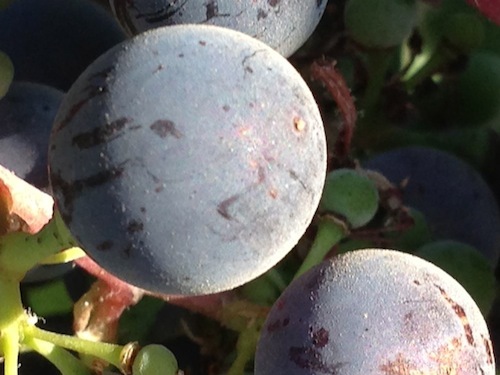 Acidic red wines, like our Dungeness Red Lemberger taste like a basket of fresh berries. The acidity cuts through rich side dishes and doesn’t overpower lighter meats. Dungeness Red is delicious with a classic Thanksgiving Dinner. 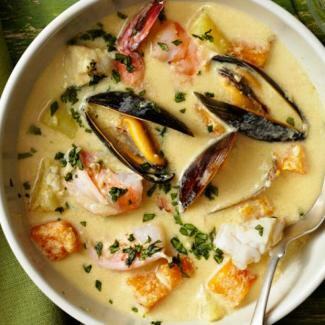 Offset Spice or Salt with Sweetness A slightly sweet white wine helps to cool spicy dishes. Our Dungeness White Riesling pairs beautifully with Thai curry. Also, salty food like ham will pair well with a sweeter wine. Think spiral ham glazed with cranberry orange sauce served with our Cranberry Jubilee. Yumm! Pair Light with Light Pork is a lighter meat, so you want to pair it with a medium bodied red wine. Our 2014 Zinfandel is perfect with roast pork. As a side note, Washington State Zinfandel is very different from California Zinfandel, which tends to be big and taste of purple fruits. Washington Zin tends to be a little lighter and taste of red fruits like raspberries. These are dry red wines – not sweet Zinfandel Rose’ which is referred to as White Zin. Big Flavors with Big Red Big reds, pair with hearty red meat. A classic pairing is grilled steak with sautéed mushrooms and a Bordeaux Blend. Our Winemaker’s Signature pairs beautifully with heartier foods. The tannins help balance the richness of a steak dinner allowing the flavors of the wine to shine. Sweet Wine with Dessert The sugar in the dessert and the sweetness in the wine will balance. My Sweet Syrah pairs well with anything chocolate, but pumpkin pie might be better with a fruitier white like our My Sweet Angevine or even Cranberry Jubilee. Sweet Rose’ wine pairs well with creamy, mild desserts. Give Them What They Want If you know that Aunt Julie only drinks sweet, white wine, don’t bother trying to convince her that she will enjoy a full bodied Cabernet Sauvignon with her Beef Wellington. It just won’t work for her. Pick up a bottle of something you know she enjoys and don’t wine sh ame. What is being wrestled with in Massachusetts is mirrored here on theLOOP. 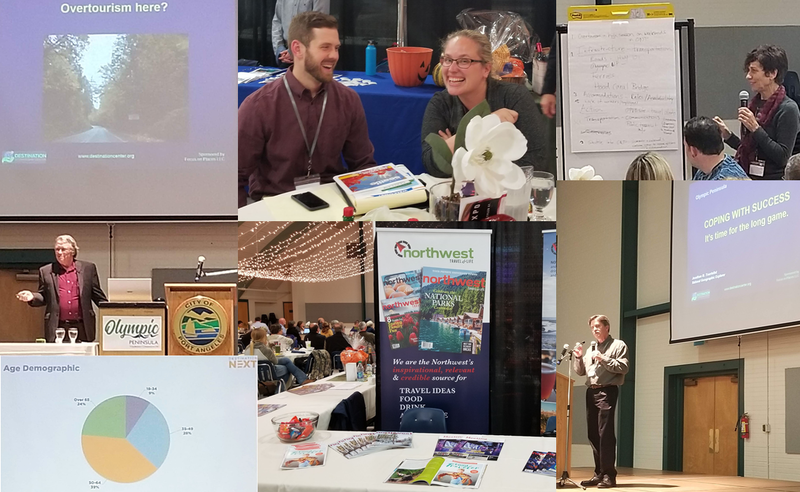 Join OCL and stay up todate on pressing B2B issues affecting the growth of Olympic Peninsula's Agri and Culinary Tourism. Many farmers in Massachusetts are increasingly discovering a new source of revenue and exposure. They are using their farms to host everything from live music performances to obstacle races to wedding receptions. “A lot of people are used to apple picking, pumpkin picking and that sort of thing,” said Brad Mitchell, policy director for the Massachusetts Farm Bureau Federation. “Now, we’re seeing people who want to have their weddings on farms, concerts, charity running races, bachelorette parties at wineries. Fifteen years ago, I didn’t know too many people who’d want to get married on a farm.” Those types of activities, which fall under the umbrella of “agritourism,” give a boost to many farms in Massachusetts. 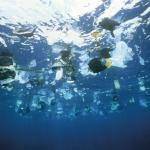 But the growing trend is not without controversy. As always Michael's will be pairing these with tasty ciders, wines, beers, and spirits. Reservations encouraged, 360-417-6929. Mingle with experienced mushroom enthusiasts to share the art and science of mushroom collecting. 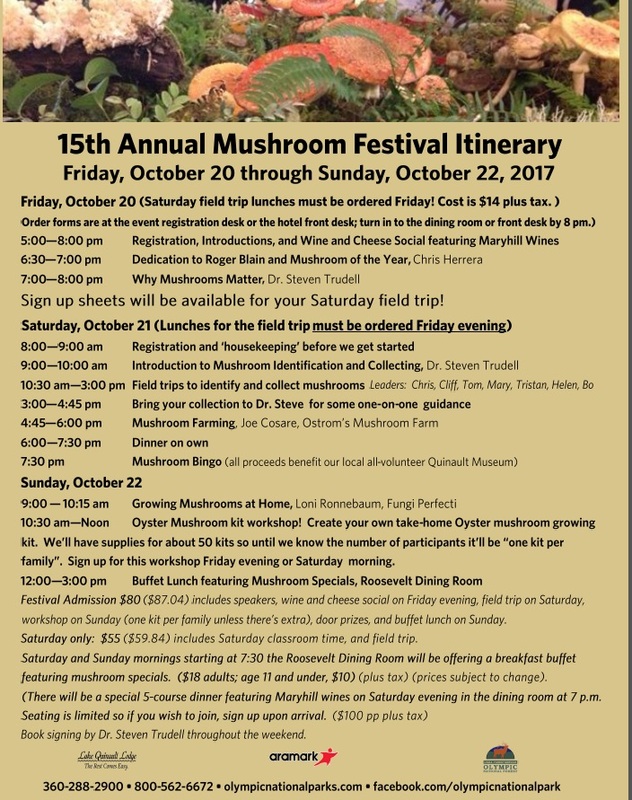 Guest speakers, guided mushroom walks, oyster mushroom kit workshop, forest health, mushroom identification classes and much more! Bring an appetite for these delicious Lake Quinault Lodge dining events that are featuring mushrooms for our Mushroom Festival. Please note that these dining events are not included in the Mushroom Festival ticket price. The buffet will be featuring mushroom specials in celebration of the Mushroom Festival. Ocean Crest Resort offers an impressive menu of local fare paired exquisitely with the restaurant’s extensive wine list. Add a view of the ocean crashing against the shore just outside the window, and each sumptuous bite becomes enhanced by the sounds and sights of the region. 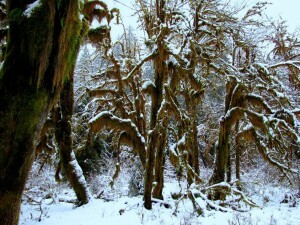 Reprint from There are few truly Pacific Northwest events that can compare to watching winter arrive in the rainforest. While many avoid the region due to the strong winds, constant downpours and occasional snow showers, there is something amazing and unique about spending time out in the wilderness of the Olympic Peninsula. Tucked away deep in Grays Harbor’s Quinault Rainforest, one of the most underrated winter experiences is waiting for you. The Lake Quinault Lodge is an iconic lodge in the Pacific Northwest and by far the crown jewel of lodges around Olympic National Park. Built in 1926, the Lake Quinault Lodge is probably most famous for hosting President Franklin Delano Roosevelt for a lunch as he toured the area that would later be Olympic National Park. In 1937, he traveled around the Peninsula, enjoying the towering trees and solitude of wilderness found along the shores of Lake Quinault. It is rumored that, while dining on a meal overlooking Lake Quinault, FDR made his decision to protect the land for good. Today, the Quinault Rainforest is the 6th most popular region of the Olympic Peninsula and National Park, bringing in nearly a quarter million visitors each year. Those who do make their way to the Quinault are greeted with eagles, elk, salmon and bears, as well as access to incredible trails and majestic views. In the summer, the area can be crowded and full, but the winter months give those searching for solitude, isolation and beauty the ultimate gift. During the winter months around Lake Quinault Lodge, there are numerous things to do, see and explore. 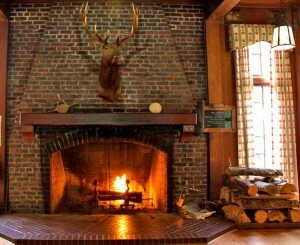 While the areas around the lodge are amazing, the first area visitors should see is the main room and fireplace of the Lake Quinault Lodge. Adorned with rocks and a huge elk head, the rustic feel of the Lake Quinault Lodge becomes evident immediately. 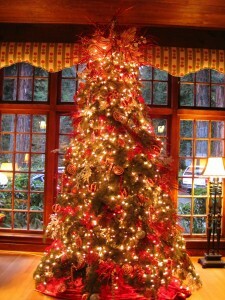 During the holidays, a large tree, decorated with local christmas ornaments, sits across the room from the fireplace. On Christmas Eve, the staff at Lake Quinault Lodge hosts an event, complete with Santa arriving with a llama before sitting next to the fire and reading “The Night Before Christmas.” With gifts, live music and roasted chestnuts, this is the perfect getaway on Christmas Eve. If you can’t make it to the Lake Quinault Lodge on Christmas Eve, don’t fret. Throughout the entire year, incredible views of Lake Quinault and the Quinault Rainforest are just a few feet from the lodge doors. Yet, true solitude is only found here in the offseason. Lake Quinault Lodge in the winter gives you a wealth of exploration mere seconds from relaxing in front of a large fireplace. 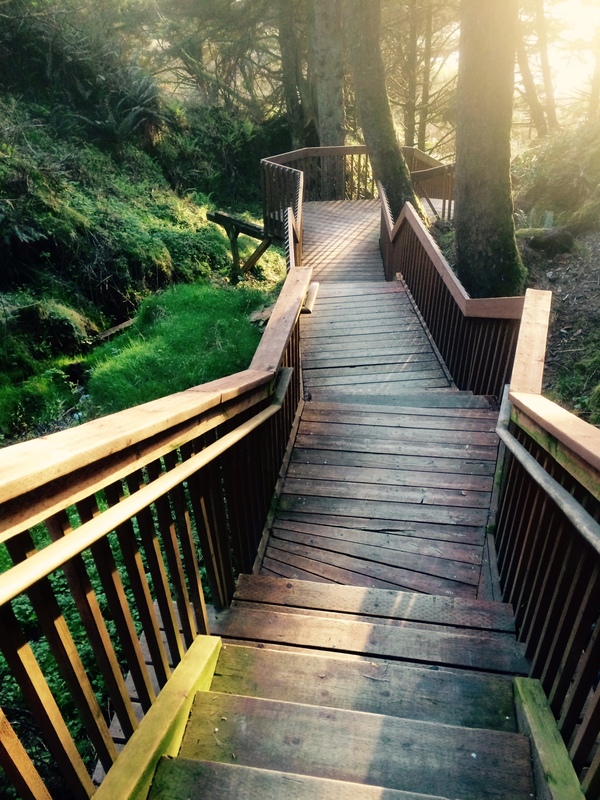 With 13 miles of trails waiting just outside, accessing and exploring the Quinault Rainforest doesn’t get any easier than at the lodge. All around the Lake Quinault Lodge, a myriad of amazing winter activities await you and your family. While hundreds of potential adventures are available, we have narrowed down four recommended activities that are perfect for the winter season. 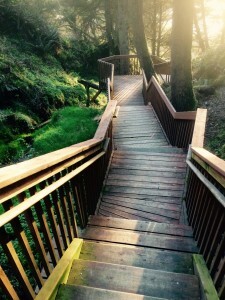 From staying in the car to getting out in the elements, and everything in between, starting a rainforest adventure from the Lake Quinault Lodge is a wonderful experience. 1. Drive the Lake Quinault Loop. To start, it is highly suggested that you drive the Lake Quinault Loop. At 31 miles roundtrip, this drive gets you close to amazing waterfalls, stunning river views, prime elk habitat, numerous picnic areas and hundreds of miles of trails. The highlights are numerous, but the drive through the rainforest and exploring Merriman Falls take the cake. Watch for elk and eagles while on this drive, as they are commonly seen. 2. View Morning Ice and Frost. In the winter, the drive is unique, with sections of the rainforest covered in thick frost during the morning hours. Seeing ferns lined in ice and frost, standing out sharply against the greens of the dense forest, is an experience everyone should have. The best place to see morning ice and frost will be north of the bridge and down at the end of the road along the North Fork of the Quinault River. For a quick walk in the frost, heading down the North Fork Trail a few miles will give you amazing views and some great areas for incredible photographs of ice and frost. 3. Take a Winter Hike. "Life is Magnifique – Now Taste the Wine at Walter Dacon Winery"
By Mary Ellen Psaltis The sign on Highway 101 says, Walter Dacon Winery – Tourist Attraction. Delay your errand in Shelton and turn right on Skookum Road. It’s not far to the winery. Award winning wines accompanied by their down-to-earth vintners are ready to charm your taste buds, and then keep you coming back for more. Lloyd and Ann Anderson, owners of Walter Dacon Winery, are a two-person show. The grapes may be grown in Eastern Washington, but the crushing, crafting, bottling and labeling are done right on their property. The vintage tasting room is open Wednesday through Sunday from noon to 6:00 p.m. Ann or Lloyd is there to talk with you about the wine, answer your questions and share a friendly visit. The official greeter is Beaux, their dog who is noticeably quiet but attentive. Their at-home winemaking enterprises blossomed into a business after years of coaxing by friends. Who imagined that that first bottle of wine they shared on a trip to Reno air show with mutual friends would end up with their marriage and a business? Both Ann and Lloyd had already had careers. Ann had retired from 25 years at the state and Lloyd had a forestry consulting business. The couple studied wine making and traveled to UC Davis to further their wine knowledge. The forecast is "delicious" all around the LOOP. No need to wait until 2016 to eat-up the National Restaurant Association's culinary forecast. Olympic Culinary Loop is serving up the YUM right now! 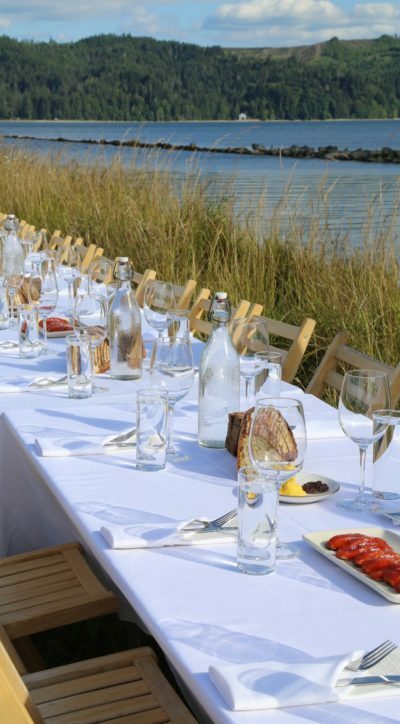 The National Restaurant Association recently presented their culinary forecast for 2016. 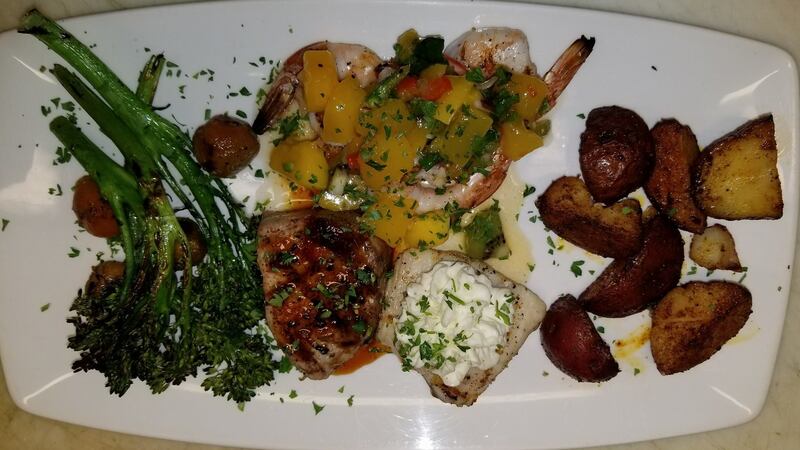 Treat Dad to a delicious meal around the LOOP! Here's a sampling of special meals and offers designed for Dad this Father's Day! Alderbrook Resort - Last minute Father's Day plans in the works? Join us for brunch and enjoy 25% off your stay plus a $50 waterfront center credit either 6/19-21 or 6/26-30 through our Pearl of the Day! Call us at 360.898.5500 for brunch reservations as space is limited. Enjoy hearty fare and waterfront golf challenges with Dad at our annual Father's Day brunch. Please call us at 360.898.5500 for reservations as space is limited. Cost is $49 for adults, $16 for kids 10 & under and brunch is complimentary for children 3 & under. MENU (Yum!) 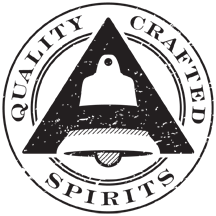 Stottle Tasting Room – In Hoodsport will be doing complimentary tastings for Dads and all duffers this Fathers day weekend. Just mention they saw this special on the Culinary Loop. Olympic Cellars – Join us all weekend for some Flip Flop Fun! Wear your flip flops, taste wine and take home a complementary tasting glass. Your choice: our traditional glass or the stemless“How’s your day” glass. Enjoy our delicious and refreshing Cranberry Jubilee Sangria – perfect for summer. Sparkling Riesling and Cranberry Jubilee will be available for tasting and glass pours. Pack a picnic and stay awhile. Taste our pepper jellies and bacon jam. Yumm! Cranberry Jubilee Sangria Recipe 1 Bottle Cranberry Jubilee ¼ Scant Cup Sugar ½ Sliced Lemon ½ Slice Lime ½ Cup Raspberries ½ Cup Limeade ½ Cup Seltzer Water Mix all ingredients and allow to marinate for 2 hours prior to serving. Adjust sugar to taste. With this fantastic warm weather, it’s definitely time to wheel out the grill . This weekend, get your favorite Golfer or Dad a Grilling Box featuring 16 pounds of cuts of Nash’s delicious pastured pork. The cuts include smoked pork chops, brats, country or spare ribs, Italian sausage links, fresh ham steaks, and ground pork, ready for the barbecue this summer! Cost is $109. Call 360-681-7458 to order your box. A $25 deposit is required. The GreenHouse Inn by the Bay provides guests with sensational flavors from our Greenhouse grown produce. The ruby red tomatoes served alongside our egg de jour, bright green chives and nasturtiums all provide complex color and taste to our breakfast plate. We are adding to that experience with our “estate grown” tea – ready for guests to blend for their preference and palate. Options include mint, chamomile and anise with plenty of local honey. Passion fruit from our long blooming Passion Flower Vine will be the next addition to our menu. Stay tuned to hear what is next from our farm to our table. Delicious Easter Eat's you'll want to Hop to! Here are some Olympic Culinary Loop Leader edibles where you won't have to hunt delicious goodness. Enjoy! 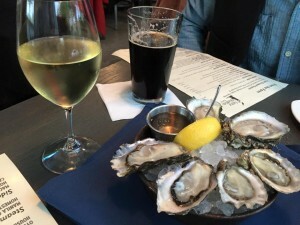 Westport Winery's spring and summer menu. Yum! In the spring we can add some of our favorites back on the menu while creating a few new delights to keep it interesting! Westport Winery will be offering Easter Brunch in addition to their regular lunch menu on Sunday, April 5 from 11 a.m. to 4 p.m. Our special brunch includes Benedictine Quiche (chock full of Cougar Gold cheese) with Tarragon Aioli, Tomato Basil with Italian Sausage Soup, our Homemade Oatmeal Rolls with Freezer Jam, Hot Coffee or Tea, and a Mimosa, with award-winning sparkling wines blended with freshly-squeezed orange juice. We are happy to make substitutions too! One of the best things about living on Washington’s coast is the casual relaxed atmosphere. Westport Winery is no exception. We do encourage you to make reservations since seating is limited. Call 360-648-2224. Easter Sunday is just around the corner! Join the fun at Lake Quinault Lodge with our annual Easter egg hunt and Easter brunch in the historic Roosevelt Dining Room! The food! It goes without saying that anytime someone else does the cooking, it tastes just a little better. Kalaloch chefs are working hard to make sure that our hopping Easter menu won't disappoint. We'll be having two specials that day; Free Range Braised Lamb Shanks and Fresh Neah Bay Halibut. The lamb shanks will be served with creamy bleu cheese polenta and shiitake mushrooms. The Neah Bay Halibut is going to be served with a creamy parmesan risotto and sautéed asparagus, topped with a lemon drizzle. Also, please note that if either of those choices are not hopping for you for whatever reason, we are also offering the full regular menu as an option as well. Creamy Vanilla (enough said)Come into Sweet & Salty today serving Cups of Awesome until 9pm. "Life's better with froyo"
Almost Easter, twice a year Kokopelli Grill offers their famous brunch. Easter and Mother's Day. Reservations recommended! 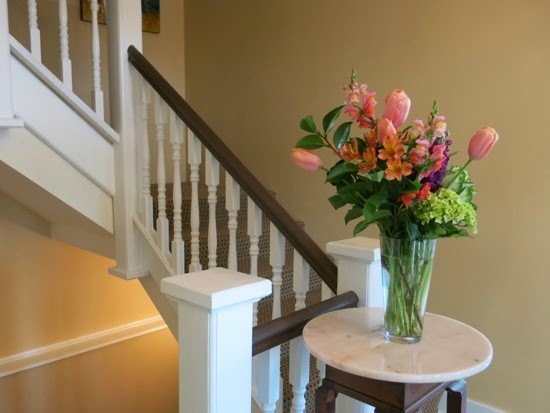 Some great tips on getting more vibrant, natural colors! Nash's eggs are on sale at the Farm Store right now too, time to stock up. Salish Room Easter Sunday Buffet! 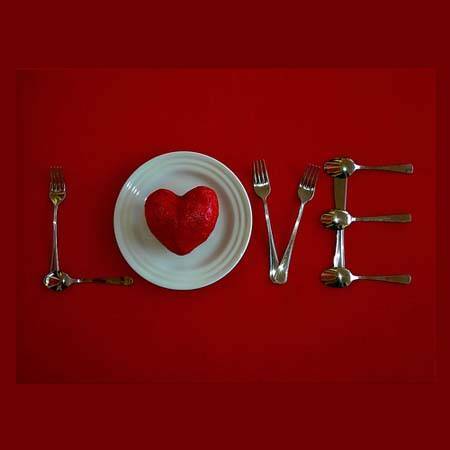 Sunday, April 5th, enjoy Easter dinner at Nourish and leave the cooking to us! We have everything you need to gather and send an Easter basket to a friend, student, family member. Plus we're handcrafting our own chocolate eggs this year at Elevated Candy Co.! Adjacent to Elevated Ice Cream, 631 Water Street. Don't forget to make your Easter Brunch reservations...just call the Fireside, they will get you all taken care of...360.437.7412. Where's the egg? Please join Alderbrook on Sunday at noon for our waterfront Easter egg hunts! Children under 5 years are welcome to hunt on our Cottage Lawn and children between 5-10 years old can hunt on our Waterfront Lawn! Complimentary family photos will be available on our Waterfront from 10AM-3PM! Easter egg coloring will be available to kids of all ages on Saturday, from non-4PM. Both hotel and non-hotel guests are welcome to these complimentary activities. Please call us at 360.898.2145 for more information. Coffee, Tea & Coco for Christmas please! Warm up this winter (or anytime) with these wonder Olympic Culinary Loop drinks. Enjoy! Star anise, cinnamon, and passion fruit nectar add a special twist to this holiday tea. (Inspired by Grovestreet Brewery & Tea House) Ingredients 2 cups water 3 tea bags (unflavored black tea) 4 star anise 1 3 inch cinnamon stick 1 cup passion fruit nectar 3 tablespoons honey 2 tablespoons lemon juice Directions In a medium saucepan bring water to boiling. Add tea bags, anise, and cinnamon stick. Reduce heat. simmer, uncovered, for 3 to 5 minutes. Discard tea bags and cinnamon stick. Stir in nectar, honey, and lemon juice. Heat through. Pour tea mixture into four heat-proof cups, floating a star anise on top of each. Makes 4 servings. A cup of this creamy, spicy hot cocoa drink makes coming in out of the cold even more of a treat (Inspired by Tinderbox Roasters & coffee houses) Ingredients 3 cups half-and-half or light cream* 3/4 cup vanilla-flavor baking pieces or vanilla-flavor candy coating, chopped stick cinnamon 1/8 teaspoon ground nutmeg 1 teaspoon vanilla 1/4 teaspoon almond extract Slivers of vanilla-flavor candy coating (optional) Ground cinnamon (optional) Directions Combine 1/4 cup of the half-and-half or light cream, vanilla baking pieces or chopped candy coating, stick cinnamon, and nutmeg in a medium saucepan; whisk over low heat until vanilla baking pieces or candy is melted. Remove stick cinnamon. Add remaining half-and-half or light cream. Whisk until heated through. Remove from heat. Stir in vanilla and almond extract. Serve warm in cups or mugs; top with slivers of vanilla-flavor candy coating and sprinkle with cinnamon, if desired. Makes 5 (6-ounce) servings. Enjoy an Italian drink that starts with espresso. If you don't have an espresso machine, you can improvise and brew this coffee in a drip coffeemaker (Inspired by Sunrise Coffee Company!) Ingredients 1 cup hot brewed espresso 1/4 cup flavored liquid nondairy creamer, such as amaretto, Irish creme, or French vanilla dash ground cinnamon 1/2 cup vanilla ice cream dash ground cardamom Directions Stir together the hot espresso, creamer, and cinnamon in a glass measure. Pour into 2 mugs. Add a scoop of ice cream to each and sprinkle with cardamom. Makes 2 (6-ounce) servings. Long before the Pacific Northwest became known for producing table apples like the Red Delicious, it was cider apple country. Gnarly, feral fruits with strange names like Yarlington Mill and Brown Snout, cider apples are nearly inedible, but they provide just the right acid, tannin and aroma required to make complex, fine hard cider. These pioneer-era drinking-apples (which were a mainstay of a budding American nation) were all but wiped out by Prohibition. But spurred in part by Americans' thirst for all things gluten-free (roughly 30% of Americans are now shopping for products labeled "GF"), naturally-GF hard cider is swiftly staging its comeback in the country, and cider apples trees have begun to reclaim their place in northwest orchards. 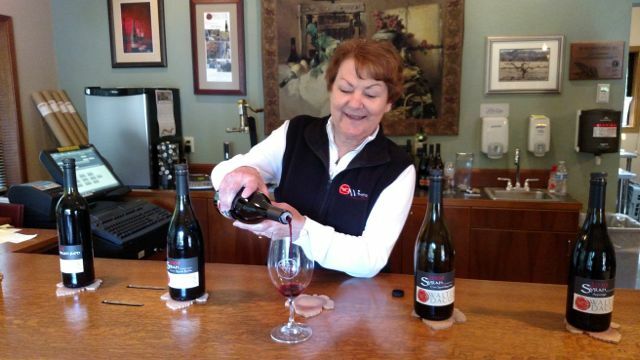 Delicious news for Olympic Peninsula Wine lovers! Andy Perdue of www.greatnorthwestwine.com reports that with wine grape harvest getting into full swing in another week to 10 days, Washington wine grape growers and winemakers anticipate another record harvest. Experts expect this year's harvest to yield at least a 10 percent increase in grapes, which would put this fall's total at about 230,000 tons. This will easily surpass last year's record harvest. Read more and then get ready for LOTS of wonderful swirling, sipping and spitting! Roast some pepper with some olive oil, when they are roasted, add some fresh diced roma tomatoes and cook until soft. We're happy to share this reprint of "Living On the Peninsula" featuring Marrowstone Vineyards. Enjoy the read as you prepare you Culinary Adventure visit to the Olympic Culinary Loop! Read the rest of the story here! Our recipe offering is our popular Almond Carrot Cake, which is gluten free and dairy free...although neither are missed at all. It is moist and not too sweet. We like it best when made with Nash's sweet organic carrots. baking powder and combine all. Add beaten eggs and mix. Pour into lined cake tin and bake for 45-50 mins until center is firm. Sprinkle toasted, sliced almonds on the top. some grated carrots and our signature decor is a fresh carrot top! Round the LOOP! AMMMazing things cooking in Mason County! Of the 4 counties comprising the Olympic Culinary Loop. Mason County boasts the most entry points welcoming you on the Olympic Peninsula. So whether you arrive into Mason along the scenic Hood Canal from the North, or off the Seattle-Bremerton Ferry through Belfair, or escape from the concret of Olympia for Olympic Mountains crowing Shelton, Mason County's abundant recreational options are second only to their delicious places to eat and experience Culinary Adventure. Make plans to stay a few days and gobble up all there is to see and taste! Greece going through to the World Cup Round of 16! Time to celebrate Greek Food Festival: Sample flavors from the Greek Isles including saganaki, assorted dolmades, Greek lamb chops, souvlaki, moussaka, baklavas and much more at Little Creek Casino & Resort. Must be 21 or older to attend. Walter Dacon Wines shared a Great Northwest Wine Thank You to Andy Purdue and Eric Degerman! 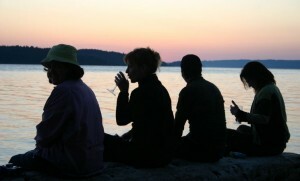 What are the most outstanding Northwest wines? Here are the 12 best wines from Washington and Oregon that we've tasted recently under blind conditions. Between World Cup Soccer cheers! Mo and crew are serving up Spooner Farm's Strawberries are at Smoking Mo's! 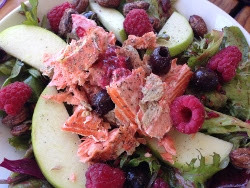 Try a Summer Solstice Salad while supplies last. Fresh and delicious! Friday: Allyn's Got Talent - Youth 21 & younger 5p. Saturday: Festival 10a - 6p, Salmon Bake noon to 6p. Sunday: Festival 11a - 6p, Geoduck & other seafood specialties, Geoduck Gallup 12:30, Oyster shucking contests throughout the day, Danny Vernon "Illusions of Elvis" 4p. Invites you to enter to be a contestant in the Alderboork Resort's annual Oyster Eating Contest on July 3rd! Stottle is proud of 6 Seattle Wine Awards! Two Double Golds for: 2011 Roussanne and 2011 Homme (Malbec/Syrah blend). 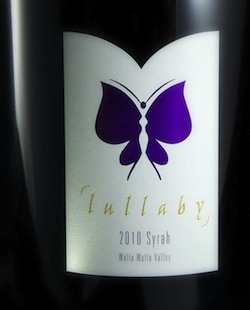 Three Golds on for: 2011 Cabernet Sauvignon, 2011 Elerding 6 Prong Syrah, and 2011 Malbec. Silver on our 2011 Merlot. Stop in a taste these winners! 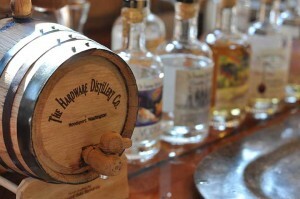 Recently Jan and Chuck "cross pollinated" Hardware Distillery Co. with fellow OCL members at Alpenfire Cidery. They wrote this great blog post about their bee encounters! "When the air at this organic cidery vibrates from bee activity, it's time to rejoice." 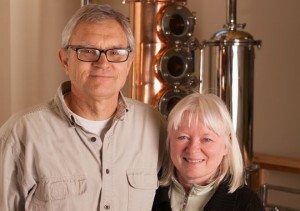 Recently we visited Nancy and Steve, owners of Alpenfire, an organic cidery due north of our distillery. Their apple trees were in bloom. It was a sunny day... read more! Is pleased to announce that they're "Picking up grain on Tuesday! Getting ready to brew a few of the favs!! IPA, Russian Imperial Stout, & Saison! YAY!!! Cheers!" These new in-house crafted Grove Street brews should be done by the time you read this. Drop in for a tasting - and a burger too! - Yum! Sometimes its more than just Salmon! U-Pick is now OPEN! The Salmon Center's U-Pick is open Monday through Friday from 8 to 4. We'll also be open this Saturday from 11 to 3. Come and get your organic garlic, peas, and strawberries while they last! "So much is happening in Indian County this weekend! Fire works stands open at Squaxin, located just past the Little Creek Casino Resort & RV PARK in the parking lot on highway 108. (If you're located near a different tribe, their stands are opening too! )"Canoe families are busily gearing up for the journey to Bella Bella. Check out the BC CAN maps. This First Nation is "way up north." The Squaxin Canoe family leaves on Sunday. It's a long trek and many will only be able to participate for short bursts. Some will be gone for 45 days!" My favorite part of the farm owners’ retreat was watching all the kids in this community play outside all day long and into the night. I’m old enough to remember a time when we did that as children even in… Read More! Is looking forward to being at Lost Mountain Lavender in a couple weeks. So beautiful and serene. Come join us! 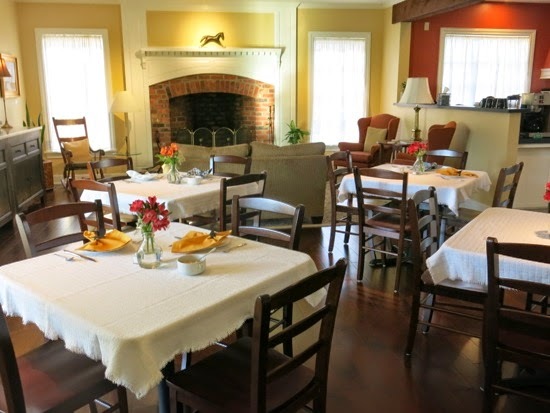 Olympic Culinary Loop's fav Travel Writer, Sue Frause , recently raved about her stay at OCL's Ravenscroft Inn. 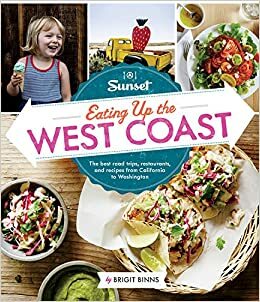 Read all about it and then book your next Port Townsend "basecamp" adventure at this lovely - foodie friendly - B&B! "As often as I visit Port Townsend, I never tire of the waterfront town on the Olympic Peninsula. Fortunately, it's just a ferry ride away from my home on Whidbey Island. So whether it's a day trip to catch lunch and a movie at the Rose Theatre or spending the weekend, I'm a happy traveler. Good restaurants, shops, museums and outdoor activities never leave me wondering what to do. Spring is here! 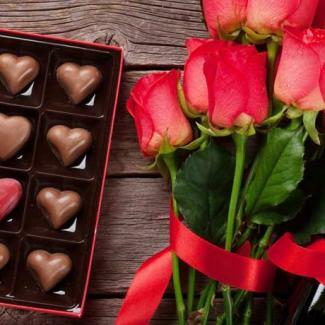 And with Mother's Day this month, (hint-hint May 11! ), don't miss the opportunity to celebrate Mom as discover delicious dining specials. Join us for our special Mother's Day -Three Course Brunch- at Rediviva! 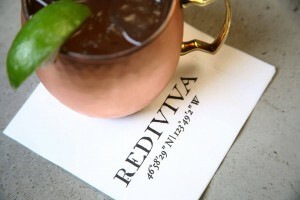 Reservations are strongly suggested, and available atwww.redivivarestaurant.com If you haven't been to one of our rare Rediviva brunch events yet, you're missing something pretty special! Make your reservations before it books up! We're celebrating Sunday, May 11th with a Mother's Day Cider Brunch at the Bad Habit Room! 9am-2pm. Bad Habit Room will be serving their delicious brunch menu paired with our craft ciders, sparkling Champagne-style cider and custom cider cocktails. All are welcome! Spoil mom with brunch at The Fireside this Mother's Day! Our blog has a recap of our Easter brunch so you can see what delicious treats will be on the menu! http://bit.ly/1mvO1ov Reservations available by calling 360.437.7412 Brunch is served! Need a LAST minute gift for mom? We can help! Gift certificates can be bought for The Inn and/or Golf Course at the front desks of both. Spoil mom with a round of golf or a dinner at The Fireside. Join us for Sunday Brunch this Mother’s Day and enjoy an abundance of local, fresh and sustainable goods. Carving station herb crusted Cape Cleare salmon with morel mushrooms, leeks and tarragon smoked pit ham with plum chutney Omelet station made to order omelets with baby shrimp, onions, peppers, ham, avocado, tomato, blue cheese, pepperjack, Tillamook and more! Sunday for Mother's Day we are offering a special limited menu. All mamas get a flower with their breakfast! Limited menu includes: Piece of quiche made with Spring Rain eggs, side of potatoes, fresh cut fruit salad and your choice of orange juice or coffee for $13. (For those that are gluten free we are offering a veggie egg scramble.) Can't wait to see you all! Lots of Mother's Day baskets available at Westport Winery. All under $39. Wine club members receive a 10% discount on all plants. Remember we also have tons of individual plants and potting soil if you want to make your own creation. Lots of luscious baskets and pretty plants in the nursery for Mother's Day. If you'd rather get her wine, cider, scarves or a gift basket we always gift wrap for free at Westport Winery. Have you made your reservations for Mother's Day yet??? We still have room. Buffet served 11am-3pm. Call soon (360) 462-0163. Bring the mom in your life to Blondie's Plate for Mother's Day dinner! We have some spectacular specials including Halibut, Rack of Lamb & Filet Mignon! You can purchase glasses or cups individually. And, with Mother’s Day just a couple of days from now, we packaged an “ I love you, Mom” gift which includes the following for $19.99.Now You Can Speak coffee mug, How’s Your Day stemless wine glass, & A Glass Heart. Your gift to Mom is all wrapped up and ready to give her a smile. Meet Nick and Tara! This great article is written and not video. But the story and these two awesome personalities, Nick and Tara of Tinderbox Coffee Roasters, are too wonderful not to share with you! Thanks to writer By Chelsea Royer and the "Grays Harbor TALK" for this story: In the Northwest, coffee is a culture unlike anywhere else in the US. I love the fact that even in a place as remote as Grays Harbor, I have access to the warmth of a hand-crafted espresso. Thanks to Nick and Tara Greeley, you can find a cozy nook and a cup of coffee as close to the ocean as Westport. Though both in the medical field, the Greeley’s have had a twenty-year-long coffee journey that began with a stovetop espresso maker and continues as an obsession. For years they jotted down ideas, sampled espresso from different shops, and thought about what they would do if they ever had the opportunity to open a coffee house of their own. It was in the most unexpected fashion that their dreams were finally realized. Read the rest of the story here and then answer the 3 content quiz questions below in the MESSAGE box and be entered to win an OCL prize package drawn at random from all correct “Personalities Around the LOOP” entries. Besides coffee what other profession are Nick and Tara involved in? What month and year did they open Tinderbox? What three senses are they using when craft roasting their delicious coffee? [bestwebsoft_contact_form] Personalities Around the LOOP is a series of video postcards (and now great articles!) highlighting some of the unique people that make-up the delicious Culinary Adventure found all around the Olympic Culinary Loop! Super Bowl Specials around the LOOP! [caption id="" align="alignleft" width="181"] Go Seahawks! [/caption] Here's a mash-up of some of the MANY delicious Super Bowl specials being offered by Olympic Culinary Loop foodies all around the Peninsula! How are you going to be eating and expressing your 12th Man pride this weekend?!?! Go Hawks! Red Lion Hotel Port Angeles Crab House We're 12-ing here at the CrabHouse and we want you to join us! 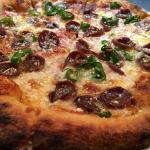 Chef has provided amazing specials to help you cheer on our Hawks this Super-Sunday! A few items in our line-up: • $9.95 - Dark Ale Mustard Burger • $5 Beer Braised Bratwurst - Topped with Dijon Bistro Mustard and Sauerkraut. Add French Fries $2 • $12 - Clam Strips, Popcorn Chicken, Toasted Cheese Ravioli, Siracha Hot Wings, Sweet Potato Fries, Onion Rings and Served with Cracked Pepper Sauce, Ranch and Cocktail Sauce • $12 Seahawk Chili Cheese Nachos - Crisp Corn Tortilla Chips with Chipotle Chicken Chili, Sliced Olives, Pico Salsa, Green Onions, Cheddar and Jack Cheese and Cilantro Sour Cream • $10 Coors Light Pitchers We've got Hawk-themed beverages and our normal Happy Hour starting at 3pm. Pourhouse It's Game Day! 3:30 kickoff! We're pouring Port Townsend C-Hawks IIPA and Pelican Seahops Pale Ale for the occasion. We'll be projecting the game on a 100" screen. Enter to win a weekend getaway to Pacific City, Oregon. GO HAWKS!! Smoking Mo's SUPER BOWL All U Can Eat BBQ Buffet Only $15 including non-alcoholic beverage. Starts at 3pm SUNDAY 2/2/14! Menu includes Pulled Pork, Ribs, Chicken Wings, Baked Beans, Mac and Cheese, Tater Tots, Coleslaw, Chips, Dips and Blue Pride Cobbler! Happy Hour Bar Prices 2-5pm. Accepting reservations now! Go Hawks! If you're hosting a Super Bowl Party at your house, let us handle all the cookin' for you! We'll be smoking a load of wings Sunday morning. Call to reserve yours! 50 Wings for $30. First come, first served. We'll be happy to pack BBQ by the lb or let us make the whole meal for you with a 4 or 5 Meat Combo big enough to feed a crowd. Call ahead to guarantee your order. If you're still looking for a fun place to watch the game, join us at Mo's! Taking reservations now. (360)462-0163. Super Bowl cider suggestion: Finnriver Dry Hopped mixed with our Habanero cider. 'Hot Hopped' cocktail suggested by friends at theThe Resort at Port Ludlow. Enjoy the game and may goodwill prevail on the field and beyond! Kalaloch Lodge The 12th Man is loud and proud at Kalaloch! We featured some delicious Seahawks-themed specials during the championship game last Sunday, including CenturyLink Field's signature "Beast Burger", which was a big hit. We couldn't have been prouder of our local team and are looking forward to cheering them on the Superbowl! 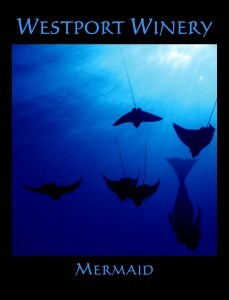 Check out our blog for more details (http://ow.ly/t5dLH) and we hope to see you on Feb. 2nd for the big game! GO HAWKS!! Sirens Pub It's official! Sirens now has 2 big TVs, so everyone can see our Seahawks beat the 49'ers this Sunday. Plenty of spots and fun 12th Man Specials, maybe even Skittle Vodka Shots!! Last keg of C-Hawk Imperial IPA has been tapped! Come on in to the tasting room and raise a glass! C-Hawk Imperial IPA. ABV is 8.5% ... GO HAWKS! Join us in the tasting room for a pint! Harbinger Winery The Twelfth-man special: Today, Saturday, and Sunday Harbinger will be offering a special to get you all ready for the big game!! 2 glasses of Bolero for $12 and growler refills for $12. Go ‪#‎Seahawks‬ !! Squaaaaaawk Go Hawks Live TV Broadcast - Super Bowl Party! At the Ajax Cafe! We will be opening early for the pre-show and broadcasting live Super Bowl XLVIII. Featuring special Squaaaaaawk Go Hawks cocktails, Hawk Ale, and special buffet. Kick off is 3:30 PT! Bring your noise makers and join the party! Pane d'Amore Don't forget to call and reserve your game day goodies! There will be lots of Seahawk Specialties to be had! Michael's Fresh Northwest Seafood & Steakhouse Go Seahawks!! Win or lose, come celebrate after the Super Bowl at Michael's! Story behind the name Fairwinds? How many years has Fairwinds been in business? What's Michael's advice for the east-side grape growers? [caption id="" align="alignleft" width="365"] A terrible plane crash gave Harbinger's Sara Gagnon new perspective on what was important to her. 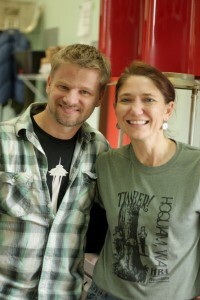 [/caption] Enjoy this reprint of Seattle Times profile of Sara from Harbinger Winery! Out of Sara Gagnon’s experience of surviving a small-plane wreck that killed the pilot, Harbinger Winery was born. By Andy Perdue, Special to The Seattle Times SARA GAGNON knew she was in trouble when the plane’s windshield hit her in the face. It was August 2004, just before wine-grape harvest was to begin, and Gagnon was riding in a Cessna 182 from her hometown of Port Angeles to Boeing Field on a cloudy, rainy night. In the plane was co-worker Tammi Hinkle, and in the pilot seat was friend Barry Koehler. They barely made it 10 miles out of town when they came through a cloud bank and everything went wrong. “We clipped the top of a ridge and went down into the trees at about 150 miles an hour,” Gagnon remembers. “It was full speed. The plane disintegrated around us, and I was pretty sure that was it. I was unlucky enough to not lose consciousness, so I get to remember.” Koehler died in the crash, and Gagnon and Hinkle, both badly injured, were left stuck all night in a remote area of Olympic National Park, wondering if they would be found, because Koehler hadn’t filed a flight plan. “It was a pretty wild night. I was afraid to fall asleep because I didn't want to wake up dead.” They were found the next morning and hiked out of the forest. Gagnon, who had returned to Port Angeles from Seattle four years earlier to follow her passion for winemaking, was the head winemaker at Olympic Cellars in nearby Sequim. She was having a blast in the job and also had discovered a love for kayaking that moved her to become a professional guide.As she recovered from a fractured sternum, cracked pelvis, broken nose and concussion, Gagnon came to a hard-earned conclusion: Life is too short to not follow your dreams. “That really shifted my perspective and made me realize that I wanted to go do my own thing. 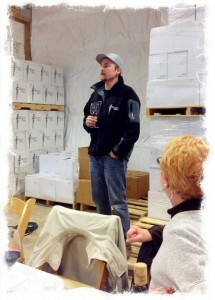 So I finished up harvest at Olympic Cellars and moved on.” Out of her near death was born Harbinger Winery. In the decade since, Gagnon has built Harbinger into a 3,000-case winery. West of Port Angeles on Highway 101, it is the northwestern-most winery in the continental United States. She shares the winery building with Hinkle, with whom she co-owns Adventures Through Kayaking, putting both her passions under one roof. As a result of the harrowing plane crash, Gagnon is stronger mentally and physically. 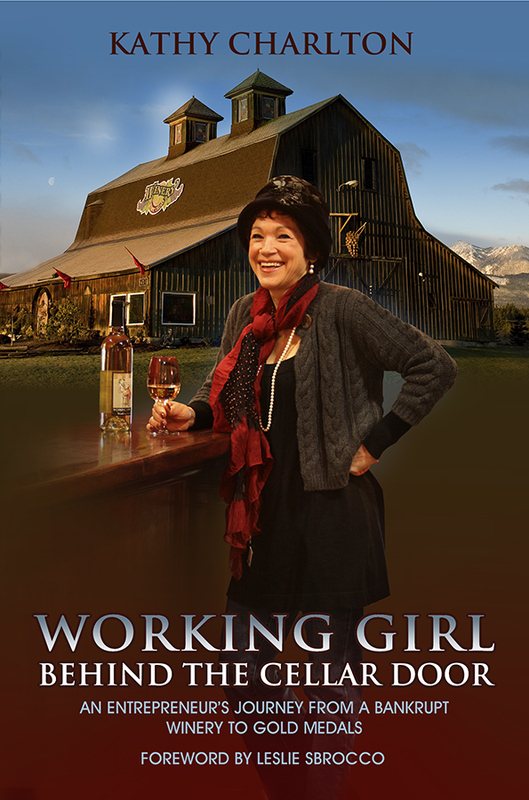 Whether she’s in the cellar making wine or working the tasting room, she takes on life in a gentle, Zen-like manner, living for the moment rather than for the paycheck. Wine won Best In Show at Sunset Magazine Wine Competition? Piece of equipment being borrowed-back? Olympic Culinary Loop is proud to reprint this great article of community service and care featured in the Seattle Times. As it celebrates the hard work and huge hearts of Blain and Kim Roberts of Westport Winery. Well done Westport Winery! Keep up the excellent work! Blain and Kim Roberts support more than 30 good causes from sales at their Westport Winery in Aberdeen. ON ANY GIVEN day, every single winery in Washington — more than 800 now — is contacted by someone seeking a donation.